Modern day systems in vehicles are able to gather a number of data points, which are later, used for research or for continuous monitoring of the vehicle. Looking at an aircraft for example, there are a number of sensors that are present throughout the aircraft collecting data and having the same transmitted to the pilot. In addition to this, the data is also captured by key systems in the aircraft where it can be analyzed later on. Similarly, there are a number of such sensors across the board in a number of vehicles, which can collect all these data points. The yaw sensor is one such sensor which can be used for critical data related to the angular velocity or momentum of the vehicle in which it is integrated into. 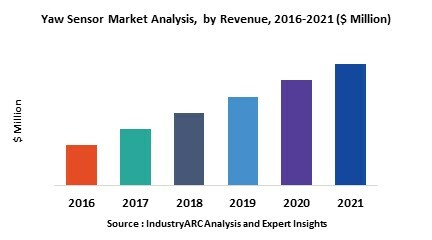 The market for yaw sensors will continue to see an increase in terms of unit shipments till the end of the forecast period, however, in terms of revenue the growth may not be as high. This is the situation with all sensor markets where eventually as a result of economies of scale, there is a drop in the average selling price of these devices and the overall revenue generated in the market tends to either drop or stagnate over a period of time. In terms of regional contribution, the Americas and the European markets are the leading contributors to the overall market and will continue to be so till well after the forecast period. The regions are home to the leading aerospace and automotive manufacturers. The yaw sensors are being integrated even more into numerous other systems, which require angular moment data. For example, it is expected that safety systems will also require yaw sensors in the coming years and the same will be integrated across almost all automobiles by the end of the forecast period.